Is it possible to have something like this implemented in a future version? Depends on what you mean. As a whole that is not a very realistic visual. Space is never so densely populated with asteroids like that. Even protoplanetary disks do not look like that. But if you mean to ask if protoplanets/disks will be implemented eventually, the answer is yes. All real astronomical phenomena will eventually be realized in SpaceEngine. I mean is it possible if a planet can look like that. With its side like that. I doubt it. I'm thinking it would collapse inward mostly. It wouldn't have a gaping hole in it. The appearance of a planet after a major collision is very different. Basically, if the collision was energetic enough to "gouge a hole", then the entire planet is simply melted instead. And on that scale planets are not rigid, anyway -- if you put a big hole into one then the rock will flow until a relatively spherical shape is restored, like anonymousgamer says. 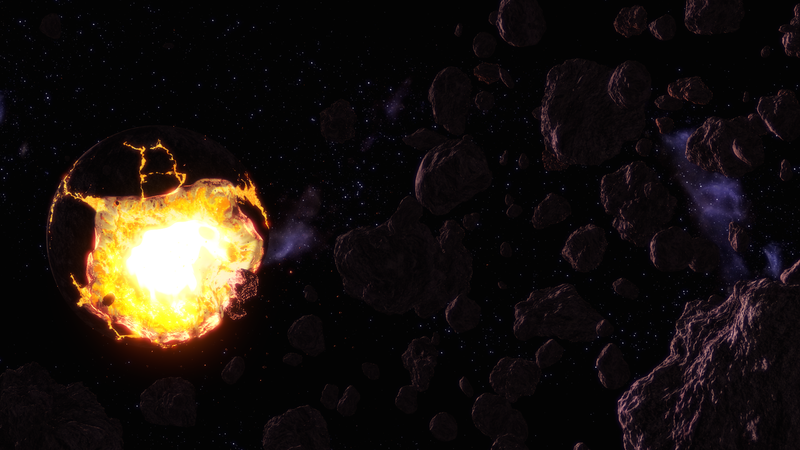 Anyway, collisions on a planetary scale are probably not something you're going to see in SE for a very long time. Implementing them is an extremely difficult computational problem.